- Outdoor Events (weddings, corporate activities, etc). Your imagination is the limit! 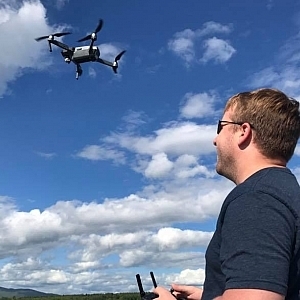 With an experienced and licensed commercial sUAS operator at your disposal, you can be confident that you'll get the media you need. Whether you have the exact shot in mind or just have a general idea, we're here to help you get it! Based in Boston, we are experienced with the various generations of DJI drones, including the Phantom 2, Phantom 3 Standard and Mavic. All for-hire jobs are shot using the DJI Mavic Pro. Lightweight and compact, the Mavic can go anywhere and still be capable of shooting amazing video. After learning how to build and operate fixed-wing R/C planes over 15 years ago (with live video downlinks) I've always keep an eye to the sky in an effort to find any way to get airborne. From earning my FAA Private Pilot ASEL to obtaining my Commercial sUAS operator, I've made it a point to continue learning and brining others along for the ride. When not flying, I'm a Product Manager for a Healthcare IT company where I get to draw on my experiences (including over a decade as a Firefighter and EMT) to fix healthcare.